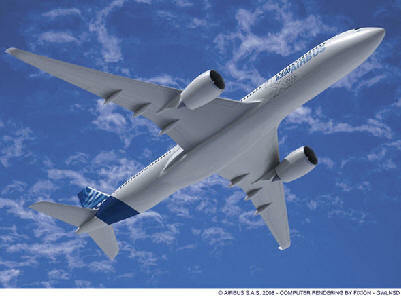 Dec. 12, 2009 – United Airlines announced a significant investment in the company’s future with a widebody aircraft order that will enable the carrier to reduce operating costs and better match aircraft to key markets it serves, while providing its customers with state-of-the-art cabin comfort. The new technology aircraft will reduce fuel burn and environmental impact, while enabling service to a broader array of international destinations. United ordered 25 Airbus A350 XWB aircraft and 25 Boeing 787 Dreamliner aircraft and has future purchase rights for 50 of each aircraft. The aircraft order follows a rigorous, six-month request for proposal process, which resulted in agreements with both manufacturers, enabling the company to meet its financial and operational objectives and respond to changes in future market conditions. The size and capabilities of the different aircraft models ensure the company has the right aircraft for the right market throughout the fleet replacement cycle. The new aircraft will open up new revenue opportunities for United as the smaller size, longer range, and lower operating costs of these aircraft allow the company to profitably serve a broader range of international destinations. The A350 has a range 11 percent greater than the current B747, and the B787 has a range 32 percent greater than the current B767. Both new aircraft offer significant improvements to the customer experience, including larger windows, more overhead bin space and improved lighting, among other features. United leverages current environment, orders from both manufacturers. This order provides United with the most efficient aircraft for its international network, providing the right range, size and operating costs for United’s diverse set of worldwide destinations, said CFO Kathryn Mikells. United Airlines operates approximately 3,300* flights a day on United and United Express to more than 200 U.S. domestic and international destinations from its hubs in Los Angeles, San Francisco, Denver, Chicago and Washington, D.C. With key global air rights in the Asia-Pacific region, Europe and Latin America, United is one of the largest international carriers based in the United States. United also is a founding member of Star Alliance, which provides connections for our customers to 1,071 destinations in 171 countries worldwide. United's 47,000 employees reside in every U.S. state and in many countries around the world. United last took delivery of aircraft in 2002, and last ordered aircraft in 1998.